To ensure that our visitors have the best experience possible, we’ve compiled an alphabetical list of venue information. If you have a question or concern not answered here, please contact us online. Rhythms Live Music Hall is completely wheelchair accessible. For more info, please contact us online. Alcoholic beverages will be served during open hours for all Rhythms Live sponsored events unless otherwise posted and or advertised. Backstage passes are not offered by Rhythms Live. This will be left up to the individual artist. Rhythms Live reserves the right to check and examine all bags entering the venue. All tickets are general admission unless otherwise posted. Rhythms Live is a fully-seated venue unless otherwise posted. Tickets may be purchased online via Etix. Purchase tickets by phone at 1-984-219-1594 or 1-800-514-3849. Rhythms Live venue has a maximum capacity of 1000 people. Event rescheduling is dependent on artist and venue availability, however, in most cases, refunds will be available at the point of purchase. For the latest event schedule updates, please visit our website, follow us on Twitter, or follow us on Facebook. Patrons who do not comply with these policies may be ejected from the venue. This policy does not apply to those with approved media credentials. Cell phone use is permitted as long as it is not a distraction to other patrons. We do ask that there is no audio recording nor video recording during the artist performance. However, at certain events, promoters/artists may request that the use of cell phones be prohibited. We will accept all major credit cards: MasterCard, VISA, American Express, and Discover. The Rhythms Live Music Hall lounge will open 2 hours before showtime. All exit doors are clearly marked for emergency evacuation. View our full food and beverage menu. Out of respect for the artists, food service will discontinue during performances. However, the bar will remain open for walk-up patrons. View our selected list of nearby hotels. We have a general admission ticket policy. Therefore, seating is on a first come first serve basis unless otherwise posted. Late arrivals will be seated upon availability. Lost and found items will be held at the ticket booth. Rhythms Live is available for event/rental usage. For more information, visit our Venue Rental page. Venue merchandise will be available during hours of operation. Artist merchandise will be available as advertised during showtime. All outside food and drink are prohibited. We offer ample FREE parking at our venue. For up-to-date, presale information, regularly check our website or sign up for our e-newsletter. You may also follow us on Twitter or on Facebook. Patrons will be allowed re-entry with identified hand stamps. Mens, Ladies, and family restrooms are all clearly marked and located inside the venue. 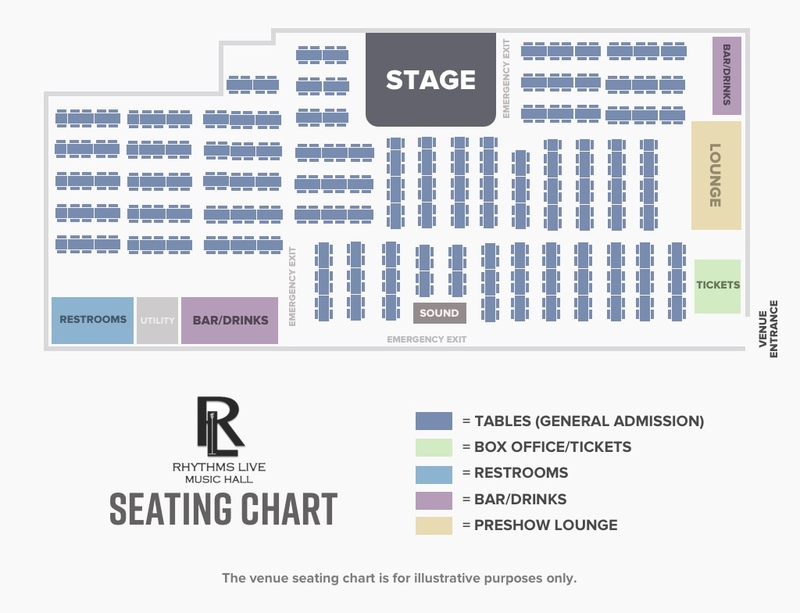 Rhythms Live Music Hall is an all-seated, general admission venue. Doors open two (2) hours before the show starts. Guests will receive a line-order ticket from the box office as they arrive. When the music hall opens for seating, before each show, guest will be seated according to their line ticket that indicates the order of arrival. Smoking is prohibited inside our venue. Tickets can be purchased online via Etix. If you are experiencing technical issues with our website, please contact us here.